High Speed Super Long 5 meters (16 feet) 90 Deg Angled Mini USB Extension Cable for Android Phones : allputer.com - Accessories for all your Portable Electronics & Computers! 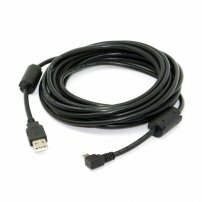 This is 15 feet USB-A type male to Angled Mini USB extension cable, which can greatly extends the distance between the computer and USB device such as cell phone, machine, GPS, memory card readers, etc. With its availability to both 2 sides, you can make sure the cable will fit your use and be a user-friendly one. - This is a right-angled cable, left-angled cable is not available at this moment. - Net Weight: 205g approx. - Package Weight: 210g Approx.